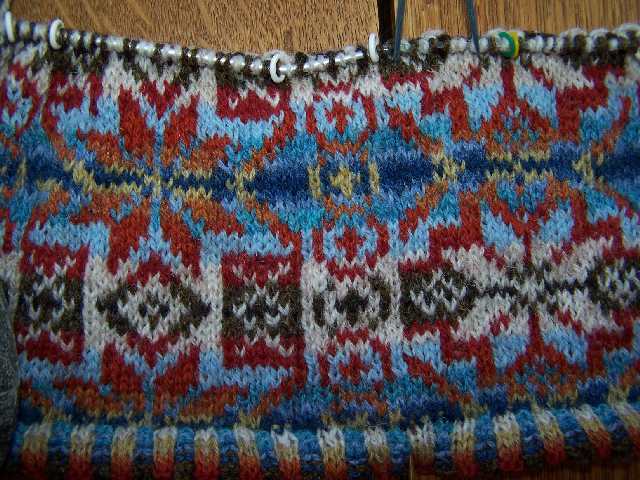 Fair Isle is the Shirt Tail Hemmed sweater from "Sweaters from Camp". Pretty complicated chart to follow so progress is slow but very satisfying. I have lots of FIs planned and have started collecting fiber. Red is Janet Szabo's "Spring Forward" cardigan from a Twist and Turns issue. It's ready to start the sleeves. I added a cable in the moss stitch area on the front cause I couldn't stand that much blank space. The cables do line up and all is straight on the sweater though the photo doesn't look like it. 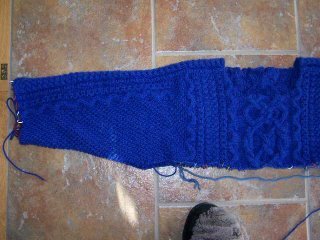 Blue is the FLAK , Follow the Leader Aran also from Janet Szabo. Second sleeve is close to the cuff as is the first. Ready to start the body probably this weekend if there is time at our knitting weekend/retreat. Really enjoying retirement. Worked in the gardens doing winter cleanup today - first time it hit 50 degrees with low wind. Some of the herbs are showing - bad since I'm sure we have at least one more big snow storm to come. All the sweaters are looking great! 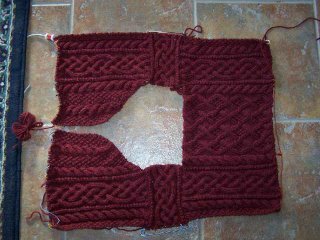 I like the added cable on the Spring Forward cardigan. I'm thinking of knitting it, but agree that the front looks a little empty. Wow, all your sweaters look great! Wow! Three gorgeous projects. It's funny that Spring Forward didn't catch my eye when I saw in Twists and Turns. Now I love it in every yarn I see it in. Love the center cable pattern on your FLAK too. Thanks everyone. Been a long time since I've had three big projects going at one time. I almost dread the arrival of Janet Szabo's new Aran design book - I know I'll want to start another sweater.